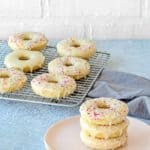 These Easy Eggless Baked Donuts are heavenly moist and cakey! This basic eggless baked donuts recipe is simple and easy to follow. They're perfect for any occasion and sure to be your family's favorite! Preheat oven to 350º F (175º C). Spray 2 donut baking pans with baking spray with flour. Note: this recipe makes 8 donuts, so you will need two donuts baking pans, or bake 1 batch first and then the others. In a separate bowl whisk together, the milk and vinegar. Let it rest for 5 minutes to thickens. Add melted cooled butter and vanilla extract; whisk to combine. Gradually add the wet ingredients into the dry ingredients until evenly combined with no lumps. The batter will be smooth and pourable. Place the batter into a piping bag. Pipe the batter into the prepared donuts baking pans until about 3/4 full. You can also use a spoon to fill the donut holes. Bake for 12 - 15 minutes and cool on a wire rack. Once the donuts are completely cool, dip them into the vanilla glaze. Return to the wire rack and sprinkle with sprinkles, if desired. Allow the glaze to set for about 20-30 minutes before stacking or serving. Add 1 tablespoon of milk and whisk to combine. If the glaze is too thick, add additional milk, 1/2 teaspoon at a time until the desired consistency is reached. Have all the ingredients at room temperature. This helps the ingredients mix better. Before filling the pan, make sure you have coated it with non-stick spray. Every time. To fill the donut pan cavities, use a piping/pastry bag. You can also scoop the batter with a spoon and fill the pan if a pastry bag is not an option. Make sure the donuts are completely cool before glazing. Can I make baked donuts without a donut pan? Yes!! Just cut the foil into 4x4 square pieces and bend gently around your middle finger. Remove your finger and place the foil into a muffin pan cavity. Shape the sides of the foil (keeping the part of the peak intact) as best as possible with your finger. Make sure to coat the foil with baking spray very well before adding the batter.